You are a thief and the best at it because you can get anything with your bare hands! However you are not an ordinary thief as you only steal from people who have more than enough! One thing is to be noted that getting money also from the rich is not an easy task. 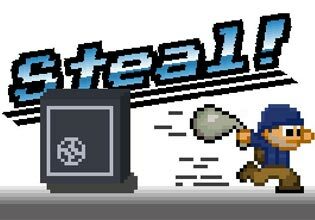 Try to collect all money bags in one perfect run, without touching and stepping on the same place twice. Move as fast as you can and don't get caught in this exciting and free puzzle gamer with increasing difficulty. Try to complete all levels, but don't get too greedy and try to avoid the alarm systems! Are you a true master thief?